Chiropractic care can be a totally new and unique concept for families. 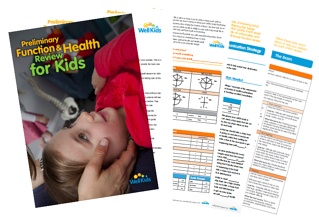 This Preliminary Function & Health Review For Kids is a tool that has been developed for you to use in practice. This Preliminary Function & Health Review For Kids gives you the structure to help parents understand that taking care of the body by focusing on the spine and nervous system is essential for optimal health. It enables you to deliver a clear and time efficient quick screen assessment for children. Your communication will be clear and you will confidently know how to recommend a full initial consultation assessment where required. A streamlined approach to (the usually) complimentary ‘quick screen’ assessment. This assessment is crucial to developing a level of confidence and trust in you and chiropractic care for children. There are usually three scenarios that provide the opportunity to help parents experience what chiropractic has to offer for their child. This product gives the instructions on how best to manage this consultation. Each review will take you less than 15 minutes to complete. You just simply follow our clear instructions on what tests are important and how to perform the age appropriate developmental tests. Our exam summary also explains why each test is important so you can relay that professionally to parents. 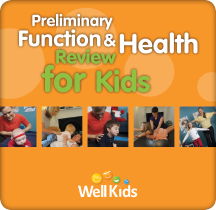 Have fun and experience the ease of quick scans through using this Preliminary Function & Health Review For Kids. This exam has been created using the flow, style and elements of the full Well Kids Exam, from the Well Kids Program. NB: Please note this product is a ‘quick screen’ exam NOT a replacement for your full Initial Consultation exam. The full Initial Exam I use is available exclusively through Well Kids.